I have a new obsession. It's Pinterest. Are you on Pinterest yet? I'm totally addicted. It is without a doubt my favorite web site in along time. What is Pinterest? 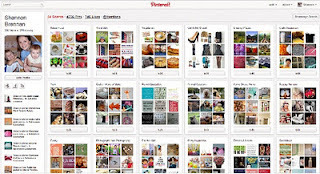 Pinterest is a Virtual Pinboard that lets you organize and share all the beautiful things you find on the web. 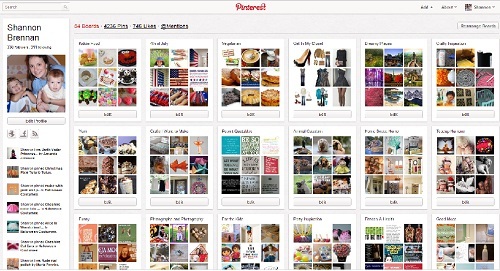 People use pinboards to plan their weddings, decorate their homes, and organize their favorite recipes. Best of all, you can browse pinboards created by other people. Browsing pinboards is a fun way to discover new things and get inspiration from people who share your interests. Pinterest is by invitation only, but if you leave me a comment including your email address, I'd be happy to send you an invite. This is a screen print of my Pinterest. You can find links and photos of all kinds of crafty, yummy, fashionable and funny stuff plus much, much more on Pinterest and save them all to your pinboards. It's like a super, awesome visual version of your favorites or bookmarks, but everything is organized on boards instead of in folders and each link has a photo, so you (and everyone else) can see it all in a glance. I first discovered Pinterest right after I started writing this blog, when I realized that thousands of people were visiting my blog with the majority coming from Pinterest. Thousands of visitors from a site I had never heard of . . . I was definitely intrigued. I'm so glad I checked it out, because I love it. I made this and few other Pinterest signs below. Feel free to grab it! I have found Pinterest to be very well designed and user-friendly. The only issue I ever have is that it sometimes runs slowly or gets overloaded, but it usually rights itself within a few minutes. Could it be that too many pinners are pinning too many pins? Nah . . . impossible! I have a feeling the creators of Pinterest were just not expecting such a HUGE response quite so quickly. If you like it then you shoulda put a pin on it! Pinterest is taking over my life (but I love it). Pintervention . . . I may be headed down that road. Go ahead and Curate the Internet. You know you want to. I don't always repin . . . Here are few Pinterest Freebies that I made just for you. If you like them, please feel free to grab them for your own use. Linking back to this blog and following me on Google Friends Connect, Pinterest or Facebook are not required, but always appreciated. Heii, I don't have a blog but I've been searching for an invite to Pinterest for months now & would be greatly appreciative if you could send me one shannonvalle@hotmail.com !! I would be so thankful! I discovered Pinterest months ago...and it was my cyber dream come true. (As you can tell if you look at how many pins and boards I have!!!! it's really quite insane actually...and it's driving my hubs crazy! :D) How did you create the GIF's with the Pinterest font? I need learn dang it! I totally just blogged about Pinterest, too!! http://kaylacheatwood.blogspot.com/2011/10/i-found-it-on-pinterest.html I am so addicted to Pinterest, I'm losing sleep, staying up all night "pinning" ha! I just found your awesome blog and am loving all the inspiration for kid activities. I'd love a pinterest invite. Downdogdc (at) gmail (dot) com. Thank you! I've been waiting & waiting for an invitation from Pintrest! If you could pretty please invite me!! Ok. I'm dying to see what I've been hearing so much about. Send an invite please. Can someone please send me an invite? alise.ballard@gmail.com THANK YOU SO MUCH. I AM ALREADY ADDICTED. Can someone please send me and invite? seledbetter90@comcast.net Thank you! I need your email address to send you a Pinterest invite, Jen. Could you please send me an invite for pinterest i want to experience the love !!!! Thank you for the awesome images, I'm using one on a post about mi pinterest obsession.